Dr. Don Hauber co-authored an article published in Aquatic Botany entitled “Genomic variation of introduced Salvinia minima in southeastern United States”. Sandrine Ferrans spends summer at Caltech doing LIGO research. Loyola Physics senior Sandrine Ferrans was accepted into the highly selective LIGO Summer Undergraduate Research Fellowship (SURF) program to pursue research at Caltech over the summer 2018. LIGO stands for the Laser Interferometer Gravitational wave Observatory, and Sandrine worked on a project called In-Situ Laser Mode Spectroscopy for Mirror Phase Mapping. Environment Program faculty member and Endowed Chair of Environmental Law, Dr. Rob Verchick and Dr. Karen Sokol contributed to a new disaster policy report. Dorothy Harrell Brown Distinguished Professor of English Chris Schaberg, a writer and affiliated faculty member in Loyola's Environment Program, this month together with students penned an article for Sierra magazine titled “An Environmental Theory Professor and His Students Reflect After Class.” The joint article is a great example of both the collaborative learning that takes place at Loyola and students’ involvement in research and publishing. Ryan Reso (English 2017) received his TEFL/TESL/TESOL certificate and was able to obtain a position tutoring English in Spain. He studied Spanish at Loyola, missing a minor by only a few classes. Starting in Fall 2018, through the Up International Program, Ryan will assist an English teacher in a secondary school in southern Spain, Nuestra Señora del Águila in Alcalá de Guadaíra in Sevilla, España. Cullen Lilley (Biology / Music, ’17) is employed as a Microbiologist at the Centers for Disease Control and Prevention (CDC). Associate Professor of Philosophy Jonathan Peterson presented his paper “Privatizing Criminal Punishment” at the American Section of the International Association for the Philosophy of Law and Social Philosophy at Boston University on August 17, 2018. 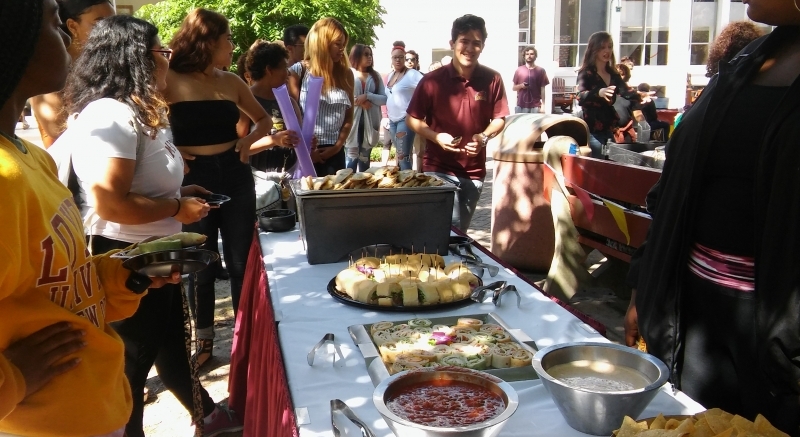 The music was playing and the food was tempting as students experienced Latin Fest in April 2018. Hispanic Music Appreciation served up a tasty and rhythmic afternoon! Destiny Karash-Givens ENVT’16 traveled to Mexico City, Mexico this summer to do research throughout the wetlands and chinampas. Chinampas are essential to Mexico City and surrounding areas because the city was built on water, and is currently sinking.